MamaEatsClean: Chocolate Zucchini Almond Protein Smoothie with Chia and Hemp - Yummy in my Tummy! And Candida diet Friendly! 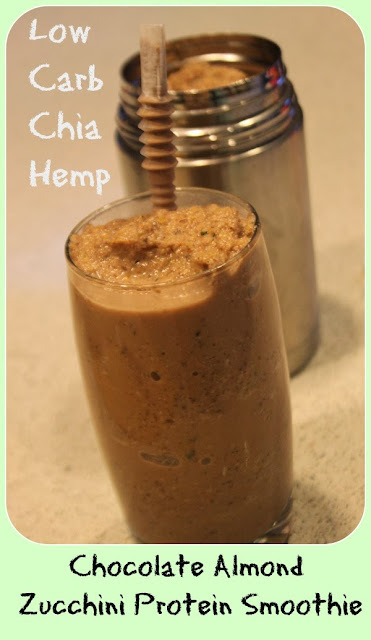 Chocolate Zucchini Almond Protein Smoothie with Chia and Hemp - Yummy in my Tummy! And Candida diet Friendly! Okay people. I sending out my smoothie recipe. I have received several requests that I share a recipe that is Candida diet friendly. It gets tricky when you give up fruit to make a tasty smoothie. But I think I have nailed it. A chocolate zucchini smoothie that tastes almost like ice cream. I make a batch before bed each night. I put one in the freezer (in a thermos) and another one in a to-go mug in the fridge. Then I have a quick breakfast ready to go. I take the thermos out and by 3:00 (my afternoon snack time) it is perfectly frosty and ready to drink. Since I have often mentioned that I use Vega One Sport Chocolate I thought I should let everyone know that Health Canada has recommended a recall on it (Chai and Chocolate flavours). I have attached a link to a couple sites discussing the issue. Vega One has not issued a recall or pulled the item from the shelves. They are standing by their product. Sigh. I just bought a new container on Friday. But my supplier actually left me a phone message and said they would exchange it. I will be taking them up on the offer. Now that is customer service. You can decide for yourself if you want to risk it, wait it out or try and get a refund. Throw everything in a the blender. I use a Ninja. Pulse until fully blended. Should come out icey but smooth. I make mine in the evening. I put one in a to-go mug in the fridge for my breakfast. I put the other half in a thermos and in the freezer. I take it out in the morning and by my afternoon snack it is perfectly frosty. Yummy!